With a friend coming for lunch and a large pot of Sweet Potato, chili and lime soup bubbling away the perfect accompaniment is a big, fat, delicious, warm bread stick. They are very moreish and you find yourself just reaching for one after another! They would be very good dipped into hummus too. The next time I make these I will try different flavours instead of the sea salt and black pepper and maybe try sesame or fennel seeds. Grease two large baking trays with a little oil and dust with semolina. Put the flour, yeast, salt and pepper into a large bowl and add the water and oil to make a soft but not sticky dough. Knead well for 10 minutes by hand on a lightly floured work surface. Divide the mixture into 12 equal portions. Roll the portions into balls, then place each ball on a floured surface and roll into a long sausage shape about 25cm x 2cm. Bake in the oven for about 20 minutes, or until the bread sticks are lightly golden-brown and feel firm to the touch. 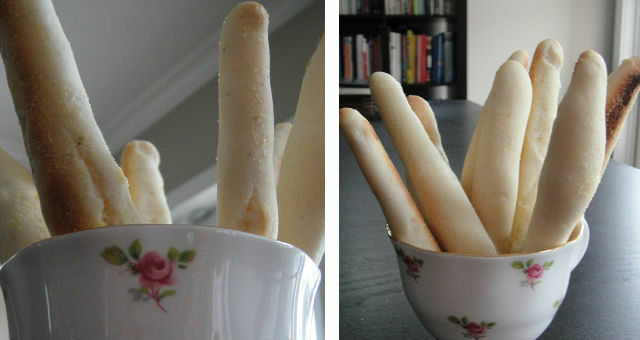 Remove the bread sticks from the oven and leave to cool on the baking trays. These look lovely. I've sesame seed Grissini before, but not for a long time. I should try again.